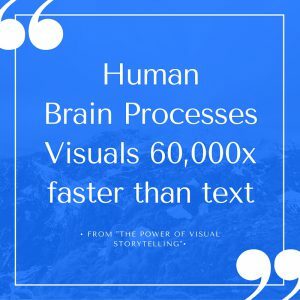 I recently finished reading Ekaterina Walter’s awesome book œThe Power of Visual Storytelling, where she talks about the science behind the findings that audiences respond better to visual content. Research has actually discovered that humans are wired to process images faster than text. As marketers, we hear all the time that in today’s day and age, images are an absolute must-have, never-ignore, always-include staple in any social media, blog, lead generation, branding, or other digital marketing campaigns. If you want higher conversions on your landing pages – use images. If you want more clicks on your social media platforms – use images. Images will enable you to stand out, connect more effectively with your audiences, attract more readers to your blog, and tell your story more convincingly. 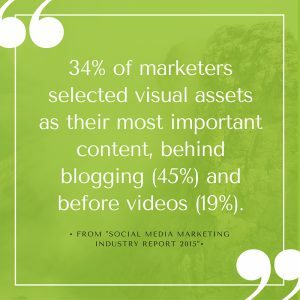 Images are critical to the success of your marketing strategies and this article by Hubspot’s @JJMawhinney, gives you 37 statistically backed good reasons why more and more marketers are putting scalable visual content management at the top of their priority lists. The reality is that we don’t use images as much as we want to. In fact in my last job, images were a significant roadblock in our daily operations, so much so, that we had to reduce image use on our social platforms by 40%. Why? Because sourcing, creating, and publishing images on a daily basis can be an operational bottleneck. Designing good quality visual content that is aligned with branding requirements takes time and requires a dedicated resource, which we often don’t have. If your wider marketing team needs to produce, let’s say 5 blogs/week (considering the content is the standard 2,000+ word count), then according to best practices, you will need to secure at least 6 images for each blog, including the header image. That’s 30 images a week. If your company has a fairly active social platform coverage (several Twitter handles, a couple of LinkedIn showcase pages & Facebook properties, and accounts on Instagram, Tumbler or Pinterest) you will probably need to push about 300 posts each week. If you decide to use images for 40% of your posts, that’s 120 images a week. At this point in time, you are looking at 150 images for your blogs and social media only. That’s 30 images a day. 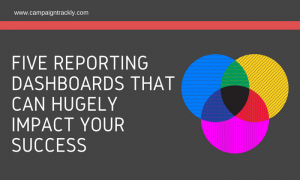 Even if you re-use a third of them, you are still left with a good number of visuals that you need to secure. Your wider marketing team might have a dedicated graphics and design resource, but creating social images would hardly be their priority – their hands are probably full building branding imagery, website banners and graphics, and product-driven collateral materials including infographics, case studies, etc. 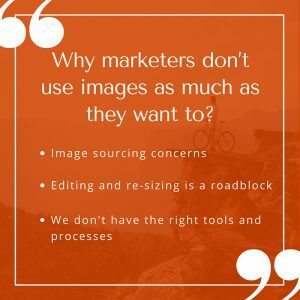 So, unless you have an automated and scalable process for creating visual content, you are going to have a hard time getting enough images for your daily tactics and initiatives. Good luck optimizing your social media or overall marketing campaign engagement and conversion metrics with that. We all prefer to err on the side of caution when it comes to using visuals, especially if it is an image we have found online. We know that there could be quite a few unpleasant legal implications if we use images that we don’t own. And it is fair to assume that probably most of the visual content on the Internet is copyrighted by someone. In result, many a time, we would rather not use an image at all than borrow one from the web. I am sure it has happened to you too – you have just distributed a nice Social post about an important piece of news only to find out later that on LinkedIn, the image looks a bit underwhelmingly and nothing like the original. Apparently, sizing issues. The time and effort needed to create the right size, well branded, good quality images that look great on every publishing platform is very often the reason why many of us prefer not use an image at all, especially if we are under pressure to deliver things fast. It’s one thing to have to create an image or two a couple of times a week. Totally different story when you need dozens of them on a daily basis, and ready to publish by 3pm, rain or shine. And the last thing you want is pixelated, uninspiring, mistake-ridden visuals. 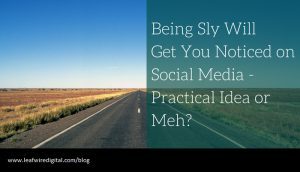 So, you’d rather not use images at all than to have to explain to your stakeholders why their blog or social media post has the opposite effect of being engaging. If you are facing these or similar operational challenges, read on. I would like to share with you a way to address this problem and convert image management from a bottleneck into a competitive advantage. According to the law, if you or your team took the photo or created the graphic from scratch, then you own it and you can do whatever you want with it. So if you have a dedicated photography, design and graphics team, you are in a good place. No worries there. When you have to use images that have been created by third parties. Unless you ask the original owner for permission or enter into a contractual agreement with them, you do not own and cannot legally manipulate or use these images. One way to go about it is to create an account with a website like www.morguefile.com that offers free images. As per its license, while you can not publish these images as is, you can certainly use them to create graphics & collages. All you need to do in return is credit the artist. There are quite a few free image web libraries out there that offer this or similar type of engagement. Some don’t even ask you to credit their sources. Here’s a blog that lists the top 15 free image website providers. Another way is to sign up with paid-for image suppliers, including Gettyimages, iStockphoto, Shutterstock, Bigstock, etc. Depending on how stretchy your marketing budget is, you can opt for stock images or highly creative unique visuals. If you don’t have a budget at all, you could opt for a basic Microsoft PowerPoint template. My favorite inbound marketing resource hubspot.com offer a great basic set of simple templates, where you can use different colors and shapes to create your graphics if you are short on pictures. Now, this could be a good problem-solving starting point, but it still doesn’t address your process challenges – the time, tools, resources and steps needed to have a smooth running operation that would help you manage the sizing, editing re-designing, publishing, and distributing of a good number of images on a daily basis without burning out your team. #1. One stop image management solution: Digital Marketing is a team exercise. Your team needs to collaborate seamlessly online to be able to be productive and effective at what they do – more so if their responsibilities cover multiple countries, time zones, and continents. So you need a tool that would give them the opportunity to share the image sourcing, design, and creation – a one-stop solution, where everyone can log in and out whenever they need to and access the resources that are available to the entire team. #2. Anyone can use it to create great images: The tool would also have to enable anyone on the team, regardless of how skilled they are at designing images, to produce good quality visuals in a straightforward and relatively fast and easy way. Let’s face it, creating powerful graphics takes time and requires special talents. As marketers, time is one thing that we are chronically short on and our main responsibility is to build campaigns that grow the business – not develop unique and stunning visual designs. But if this ideal solution could offer good quality templates featuring beautiful designs that are easy to modify, resize and re-use, wouldn’t that be great. Needless to say, it would have to include a user-friendly automated library of drag-and-drop fonts and shapes that can be edited and resized with a few clicks of the mouse. #3. Pre-sized image templates for every publishing platform: Because every platform has its own unique image size requirements, you don’t want to have people going back to their cheat-sheets every single time they need to create a new visual. That’s counter-productive and tedious. Additionally, the very process of resizing an image is time-consuming and will often downgrade the quality of your output if it’s not done right. So you want your tool to have all the different platform sizes pre-saved, organized, available and waiting to be copied and re-used in a simple and easy to manage way. #4. Use, duplicate, and reuse with just a few clicks: As marketers, we are an œinstant-gratification breed. 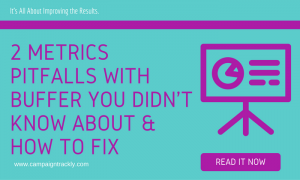 We have so many things on our plates and we are under such pressure to churn results that if a tool requires too much effort to get the desired results, we won’t use it. The best thing for me as a marketer would be to have a tool that lets me have instant access to my previous designs so that I can easily duplicate an image, make a few quick edits, and save it as a new file in minutes. Use, rinse and repeat – as simple as that. #5. Access to lots of photos, all in one place: A really effective tool would have a huge keyword-search driven library of thousands of cost-effective images. This way, your team won’t need to spend the time and effort to go through an external image provider. At the same time, you can keep your image management costs in one central place for easier budget management. #6. Image format/file type flexibility. Saving images in the right format is a big hassle. Your ideal solution should offer easy, seamless way of saving and downloading images in several formats, including .png, .jpg, and .pdf. #7. 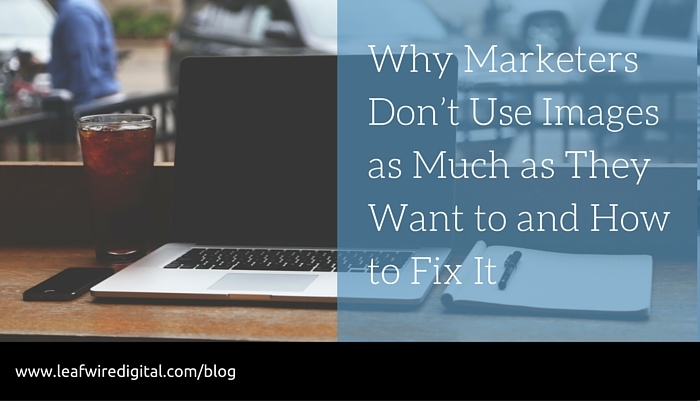 Painless alignment with Brand requirements. Last, but not least, a major must-have would be that this tool enables us to meet the requirements of the branding team and keep all our colors, fonts, logos, and key brand elements easily accessible and in one place. Instead of having to search through the pages-long branding guide to find the right web color values and go through the effort of recreating things every single time, we could just access our branding folder or have the approved color values available at all time in our work area. It exists. It’s been tried and tested by thousands. And it’s awesome. It’s called Canva. That’s www.canva.com. The revolutionary thing about @Canva is that it actually automates the creation of visual content. And fuels your team’s productivity. It enables your team to up the production of images in no time. It is so easy to use and automates almost every aspect of image sourcing, sizing, and design, that your team can literally become a mass-producing image machine in a manner of days. This software as a service solution has been created exactly with marketers in mind. It covers every “need” on the list above and offers 1 million cost-effective images to choose from. 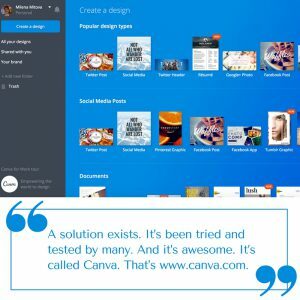 Canva creates a competitive advantage by enabling marketers to produce as many images as they need in a consistent, visually appealing format that can improve engagement and drive more sales. 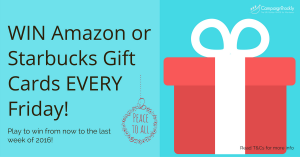 My personal experience with Canva? It did increase my images-related productivity by 250%. That’s big. Get the solution for your team. 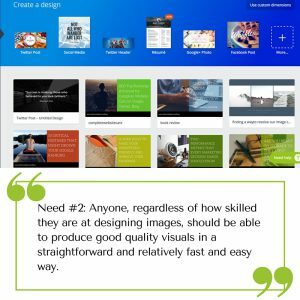 The best part is that the learning curve is almost zero and there is so much that this tool can offer that it can really help you push your visual content management to the next level. With Canva, you can keep a lot of your images in your folder, however, you need a scalable process that would allow you and your stakeholders to store, access, share and use/re-use images in a cost-effective way once they have been created. 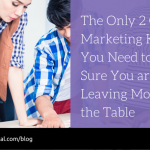 There are a number of ways to go about it, depending on what other tools you are using in your daily digital marketing ops and how many campaigns and stakeholders you are supporting at a given point in time. 2. Get the right tools and processes in place. There’s no one way to plan and implement this because different companies have different operational mechanisms. The important thing to consider is that you need to map your requirements and go with the best solution that could empower you and your team to do you job in a great and cost-effective way. Process for your bloggers: If you are using WordPress as your blog content management system, Canva offers a plugin that would enable you to connect your image management environment directly with your blog writing editor. This way, you can save a bit of time by automating the image transfer aspect, because you won’t need to do the extra steps of first downloading your images to your local machine and then uploading them again onto your blog servers. This could require that your bloggers have a Canva account too, which is a decision that depends on how your whole blog publishing process works. Process for Social Media Publishers: If you are using @Hootsuite as your Social Media automation platform, the not-so-encouraging news is that they have not developed a plugin for Canva as of yet. The good news is that Hootsuite has a wonderful online library – I wrote about it in an earlier post here – so you can have a dedicated team member responsible for managing the periodic image transfer from Canva into Hootsuite to make sure your copy-writers don’t waste their valuable time uploading and downloading images. The frequency and amount of work will very much depend on how your team is splitting your ops tasks and whether you do your social scheduling a day ahead or a week ahead, etc. Process for Stakeholders: Many a time, your stakeholders will want to see what images you are using for their deliverables before things get published. Alternatively, your campaign managers might want to keep all visuals that support a specific digital campaign in one, easily accessible place. Most often, creative outputs will be kept together with the rest of the campaign assets, so you might want to integrate your image storage solution with what your wider marketing team is already using. One way to approach this is to leverage SharePoint – most companies have it and use it, and it’s OK. The productivity challenge comes when you need to bulk-manage things or when you start running out of storage space. Then you might want to start thinking about a viable cloud storage option that has a user-friendly interface and cool sharing/viewing features. If you are not constrained by a pre-existing content library solution and need a tool that would let you upload, store, classify and share images in an automated and secure way, it might make sense to invest in a cloud storage solution like iDrive, Google Drive, DropBox, etc. I use Google Drive and Flip Drive, that’s www.flipdrive.com. I have connected my Google Drive with my blog so that I can speed up my website. My images are served directly from Google Drive, keeping my site more lightweight and letting it load faster. 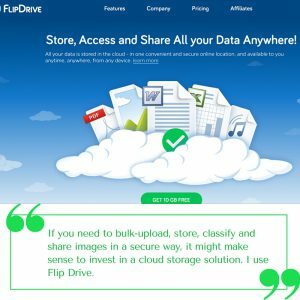 I use Flip Drive to share images with external collaborators. A quick and easy form lets you send your recipients an email that gives them online access to the pictures that they want to view and download. As simple as that. Although you don’t necessarily need to use Flip Drive, you might want to think about investing in a single, one-stop practical solution that would enable you to manage how you keep, find, and share your visual content in an effective and practical way. My recommendation would be to decide on a centralized resource management library that would require minimal maintenance and would make it easy for your to support your stakeholders, as well as daily production needs. As marketers, we are constantly under pressure to deliver better and more effective marketing campaigns that grow audiences drive sales. It is a well-known fact that images can help increase the return on our marketing efforts but often times we lack the budgets, tools and the right resources that would enable us to use as many visuals in our initiatives as we want to. If you are facing these or similar operational challenges, I hope that my blog offered a reasonably effective way to address this problem, so that you can convert image management from a bottleneck into a quick ROI driver. Let me know what you think. Suggestions & discussions, welcome.